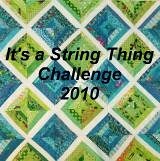 It's a String ThingChallenge: July 4th Cyber Retreat! It's another holiday and time for another cyber sewing retreat! Please go to my other site: www.susanround.com and click on the number next to the title post and you're in! Hope to hear from my former retreat guests as well as anyone new who has never participated in a cyber sew-in. Hi Susan, Count me in last year's retreat was really fun.